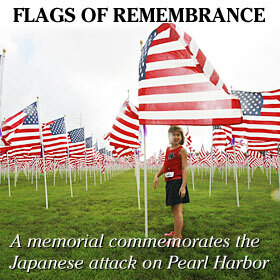 Corrie Michell, 8, visited one of 2,500 flags erected on Richardson Field at Pearl Harbor yesterday. The so-called Healing Field Flag Memorial will be on display until Monday. Ceremonies commemorating the Japanese attack on Pearl Harbor will be held today, the 66th anniversary, when Hawaii Army National Guard helicopters will fly over the USS Arizona Memorial in the place of grounded F-15 fighter jets. A plea from the mayor spurs Wal-Mart to pull specially packaged DVDs of "Superbad"